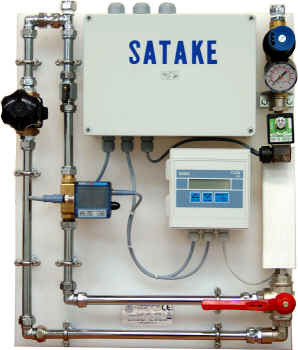 The Satake SWEC Water Panel controls and monitors the flow rate of water using all electronic components. The main use is in the addition of water to wheat and other cereal grains before milling. The host PLC connects into the terminal box and sends the target flow rate or percentage setting and open/close signals to the SWEC. The SWEC returns the actual flow rate value to the PLC. At the inlet there is a pressure regulator to control the incoming water pressure. An electrically operated solenoid valve starts and stops the flow of water dependent on the open/close signal from the host PLC. An electronic flow rate monitor displays the actual water flow rate going and returns this value to the host PLC. A 2-Way selector valve allows the operator to choose to operate the system in semi-manual or fully automatic modes. In semi-manual the host PLC will send an open/close signal to the solenoid valve and the flow detector will return the actual flow rate value but the operator will set the flow rate using the variable manual control valve. In fully automatic mode the host PLC will send a target flow rate to the automatic flow rate controller. The SWEC assembly is mounted on a food quality plastic panel and can also be used to control the flow rate of other liquid products such as additives, oils and chemicals.